Like the name suggests, this is one of the rays that can create an electric shock from 14 to 37 volts, from specialized organs that run along their bodies. 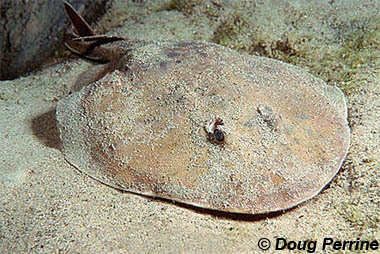 These small rays have a circular pectoral disc, with a stout tail that as two small dorsal fins and a triangular caudal (tail) fin. They are are dark brown to reddish, with irregular rings on top, and pale underneath. These coastal dwellers prefer hiding in sand and mud or seagrass during the day, and foraging for crustaceans, marine worms, and other small prey at night. The English language common names for this species are lesser electric ray, Brazilian electric ray, small electric ray, spotted torpedo ray, torpedofish, trembler and the electric ray. Other common names include arraia, arraia-eléctrica, emplasto, raia treme treme, raia-eléctrica, raia-emplasto, treme-treme, tremelga (Portuguese), brasiliansk elrokke (Danish), kleine stroomrog (Dutch), kumoma-shibire-ei (Japanese), liten darrocka (Swedish), pikkusähkörausku (Finnish), raie électrique brésilienne (French), raya eléctrica, tembladera brasilena, tembladera brasileña, temblador de mar, torpedo brasileño and trembladera (Spanish). The lesser electric rays are not commercially important to humans as a food source, however lesser electric rays have been sold as an aquarium fish in Brazil. It is frequently encountered in their natural habitat by scuba divers. Lesser electric rays have been know to knock humans down with their electric shocks although the peak voltage is only 14 – 37 volts. Care should be taken to avoid poking or annoying these animals to prevent shocks. > Check the status of the lesser electric ray at the IUCN website. The lesser electric ray can be found along the beaches and coastal waters of the western Atlantic Ocean between Argentina and North Carolina and it is locally common in the Gulf of Mexico. 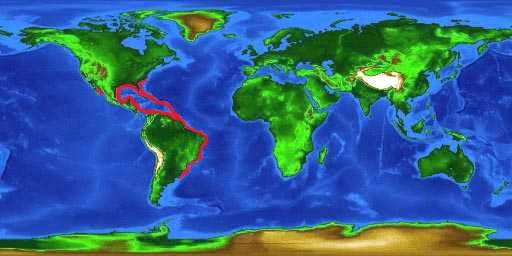 It has also been documented in the Pacific Ocean near the Yucatan. The lesser electric ray is usually found in shallow coastal waters buried beneath the sand, mud or swimming among the sea grass beds. It can sometimes be found at greater depths of up to 180 feet (54.86 meters). The lesser electric ray belongs to one of two families of electric rays. These rays have the ability to generate a strong electric discharge that is used to stun their prey and defend themselves against predators. There are two elongate electric organs visible from the front of the eyes to the rear of the disc. The lesser electric ray has a short body consisting of a round body and a short tail The gill slits are relatively small. The lesser electric ray can be distinguished from other electric rays by its moderately long snout and a preorbital length of 11% to 13% of the total length (TL). The first and second dorsal fins are very similar in size with the first dorsal fin originating posterior to the ends of the pelvic fins. The caudal fin is shaped like an equilateral triangle with membranes along the lateral sides. There is no spine on the caudal fin of this ray. This electric ray is sometimes confused with stargazers (Astroscopus species) which also have electric organs located on the dorsal surface of their heads. The dorsal surface of the lesser electric ray varies in color from dark brown to light brown or reddish orange with irregular rings or ovals. The ventral surface is white to yellowish or greenish. 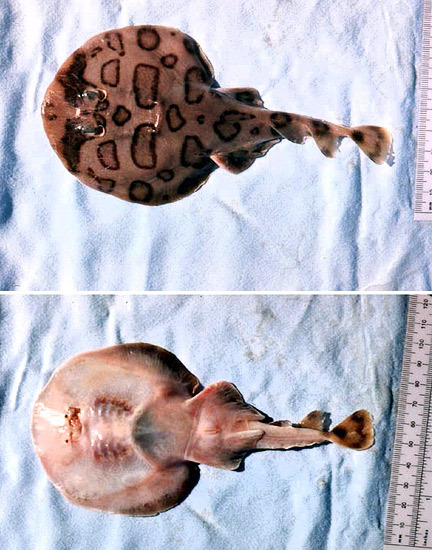 Juvenile lesser electric rays usually have a number of dark rings and blotches along with dark oval loops. The number of tooth rows varies from 17 to 34 in each jaw depending on the age and size of the ray. The cusps are conical and rather sharp. The tooth bands fall short of the corners of the mouth. The skin is soft and loose, and lacks dermal denticles or thorns. Lesser electric rays on the coast of Florida commonly mature at a length of 22-33 inches (559-838 mm) TL and 20-26 inches (508-660 mm) TL for males and females respectively. Polychaete annelids are the primary diet of the lesser electric ray. They also feed on juvenile snake eels, anemones, small bony fish and crustaceans. Lesser electric rays, like all rays, have an ovoviviparous mode of reproduction. The females retain developing embryos in utero. The embryos are first nourished with yolk and then with histotroph, a protein-rich liquid secreted from the mother ray’s uterine lining. The lesser electric ray gives birth to between 4 and 15 young after a gestation period of three months, however researchers believe there is a possibility of diapause (the cessation of development after fertilization until conditions are optimal). This would suggest a longer gestation period of 11 – 12 months, although further research is needed. The young are born with the ability to give off electrical charges. 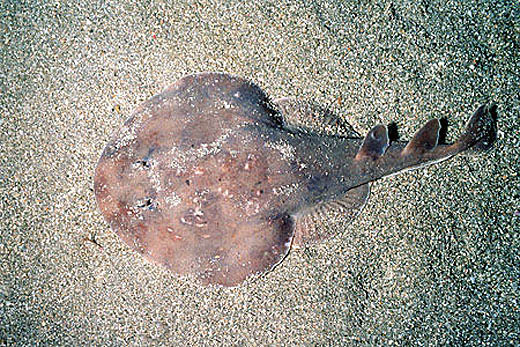 Predators of the lesser electric ray may include large fishes and sharks. Lesser electric rays in captivity often exhibit monogenean infestations of the gills. J.F.M. von Olfers first described Torpedo brasiliensis in 1831 in Germany. This name was later changed to the currently valid N. bancroftii. Synonyms include Narcine brasiliensis (Olfers 1831) and Narcine brachypleura (Miranda-Ribeiro, 1923). The genus name Narcine is derived from the Greek “narke” meaning numbness in reference to its ability to produce an electrical shock.